Lynsey Sharp soared safely through to the women’s 800m semi-finals of the Olympic Games in Rio barely breaking a sweat. But she insists her dominant performance in the heats was not as easy as it seemed as she looks to adapt to racing against unfamiliar faces. The 26-year-old went in the first of eight heats yesterday morning and secured the perfect start with a win to secure automatic qualification to the semi-finals, which will take place early tomorrow morning. Romania’s Florina Pierdevara took the race out to lead after one lap but Sharp bided her time perfectly to hit the front at 600m and held off Serbia’s Amela Terzic to win in 2:00:03minutes. Sharp’s heat was one of the slowest – conserving energy was important on the day with track temperature reaching 36 degrees Celsius. And Sharp described the result as pleasing although it tested her mentally perhaps more than physically. “It was a good run, I was just trying to stay out of trouble and get a clear run in,” she said. “You can’t do anything unless you make the final so it was good to finally get out there. Edinburgh’s Sharp knew coming into these Games that she would have her work cut out to challenge for a podium finish. The women’s 800m has been dominated by two athletes – South Africa’s Caster Semenya, who had to undergo gender testing before being cleared to compete in Rio, and Burundi’s Francine Niyonsaba. 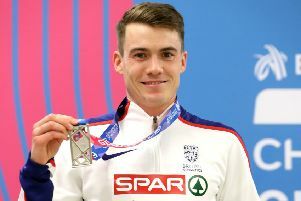 A bronze medal stands as a more realistic yet still incredibly challenging goal for Sharp, who insists setting a new British record - it currently stands at 1:56.21minutes, set by Dame Kelly Holmes in 1995 - would also serve as a great achievement in Rio. “The British record is probably the thing that I would like to get most. I think that’s 1:56.2,” she added. “Everyone can see it’s two separate races so there’s nothing I can do. There’s nothing anyone else can do. It’s out of our control really so you just have to focus on your own race. Fellow Scot Andy Butchart qualified for tomorrow’s 5000m final alongside Mo Farah, but Chris Bennett and Mark Dry – along with Englishman Nick Miller – missed out on reaching the hammer final.